With the upcoming October EMV Compliance deadline more attention is being brought to Point of Sale security for every retail application today. This infographic cover the key concerns and steps you can take to keep safe from the new threats to customer and business data. What’s top of mind for most retailers? A POS system that can enable the organization to accept new mobile payment options, and that will take the EMV migration in stride. In fact, both retailers and suppliers agree that the ability to accept mobile wallet has had a significant impact on POS software purchasing decisions, as has EMV-readiness and overall payment security with the October 2015 deadline quickly approaching. Frankly, the October 1 deadline for compliance with the EMV mandate is on every retail IT professional’s radar for 2015. The fast-approaching liability shift will place the responsibility for fraud conducted in-store squarely on the shoulders of those retailers that are not compliant by the Q4 deadline. In addition to smart card compliance, savvy retail execs are earmarking pricing intelligence, mobile, and other next-gen innovations to the top of their to-do lists. With the state of POS evolving on a constant basis, every retailer — even the most forward thinking and technological savvy — can benefit from exploring and putting a plan in place to tackle payments in 2015. With data breaches on the rise, security is top of mind for retailers. What steps do you recommend retailers take to better secure the POS? Many steps – from simple to more involved. First, invest in POS that’s adaptable and ready to accept future upgrades, like the acceptance of a variety of EMV devices. In terms of compatibility, does the system have enough ports to plug in third party peripherals? And, do those peripherals have the ability to address security concerns? Can you upgrade to an encryption-capable MSR? Does that MSR include a biometrics reader, to ensure user security? Does the terminal feature powered USB ports to plug in a variety of security-related devices? It all starts with a POS device that can embrace new add-ons (built-in or third party), as well as a software partner taking measures to ensure data is secured on the software side. Security is not simply the hardware, payment processor, or software provider’s responsibility. A retailer should work with all of its partners to ensure that they’re providing an environment as safe and secure as possible to transact business. Apple Pay has officially been released and retailers have been quick to sign up. How will this and other NFC technologies impact the future of POS? POS, in various forms, continues to be the backbone of the transaction. An operation may have traditional POS terminals, peripherals, tablets, digital displays, and customer-accessible kiosks — all part of the POS ecosystem. Apple Pay becomes another part of that ecosystem. 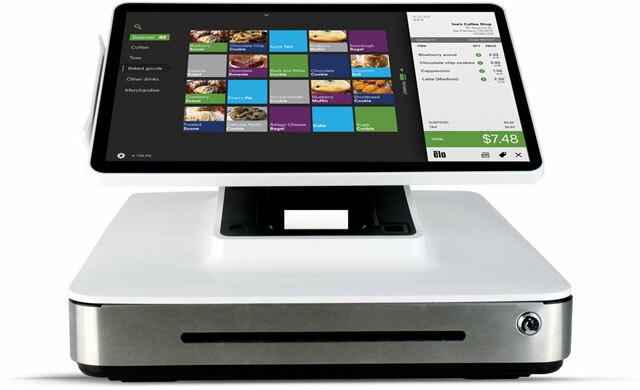 POS systems need to be designed to anticipate new technologies. It’s a natural evolution, on-going since the days of simple cash registers, evolving to ECRs, to PCbased POS systems, now with continued evolution and a focus on the payment function of POS. The transaction doesn’t go away. For retailers about to embark on a new POS hardware deployment, what advice would you provide? Be open-minded. Consider an investment strategy that addresses both current and future requirements along with emerging technologies. Don’t focus strictly on price without giving thought to total cost of ownership. Think about how emerging technologies can be embraced to protect your POS investment for the future. Don’t forget the environment in which these technologies will be implemented and invest in a system that can endure to deliver maximum uptime. Select products with demonstrated reliability track records and vendor partners who offer comprehensive care programs. Regardless of new technology trends, reliability never falls out of importance or fashion. According to the most recent RIS News Store System Study, retailers are making plans to invest in POS hardware at an increased rate. What features should they be looking at to stay ahead of the curve? POS must be as adaptable as the businesses who are investing in POS. Newer POS technologies include EMV, near field communications, chip-and-pin, payment methods and card formats from other countries that may migrate to our market. POS must be adaptable to these changes. We can delay investment in POS waiting for the market to settle on certain POS features, or we can grow and evolve with POS as needs change. The evolution of POS is not stagnant — with new security and digital signage features, as well as enhanced customer experience, we’ll see growth and implementation throughout the market and industry.